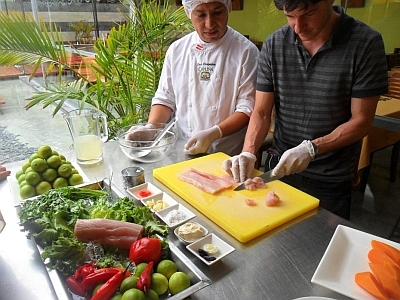 Food is amazing in Peru, thats why we offer you 3 special tours where you can taste peru ! Let us pick you up from the airport! Someone of Southamericaplanet pick you up at the airport with a sign with your name. This person brings you direct to the hotel of your choice. 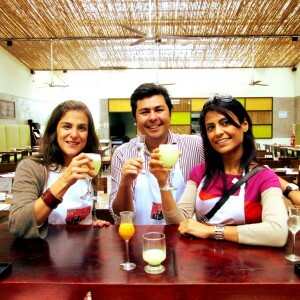 Lima/ a fantastic city with many options for food lovers, learn to cook your own Peruvian meal and Pisco sour. 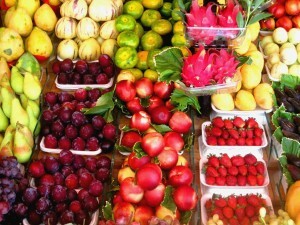 The market tour takes place from 9am – 11am before our lunch class (11am – 2pm). Guided excursion to the “Magical Water Circuit” the largest water fountain compound in the world, certified by Guinness World Records. 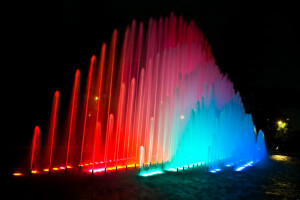 Here you will enjoy a wonderful display of water, light, music and images presented at Reserve Park, one of Limas’ most beautiful urban areas. This class is for people who love traditional foods and want to make it at home! You’ll love the relaxed atmosphere with no dull demo’s, because we believe in the hands-on approach. You will make an authentic Peruvian dish to tantalise your tastebuds and later enjoy your achievements.To cook, we use ceramic pots the same as our ancestors did on this way we will keep all the flavour as more natural they are. “Aji de Pollo” in English chili chicken (Main Course), consists of thin strips of chicken served with a creamy yellow and spicy sauce, made with ají amarillo (yellow chilis), cheese, milk, cronchi bread. As starter, we will teach you to prepare the most 2 Typical Peruvian souces: Papas a la Huancaina (Huancayo-style potatoes) this souce came from the middle of the Andes of Peru and Ocopa souce came from the south of the Andes near to Cusco, both starters consisting of a creamy slightly spicy sauce, one made with the freshest aromatic herbs from our Mountains and the other fresh local chili with cheese souce both served with native organic sliced boiled potatoes. Pisco Sour: One of the most popular cocktails in Peru is the Pisco Sour. 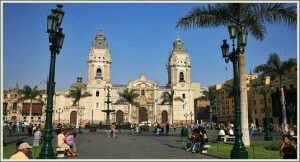 It is based on the Pisco (kind of brandy) and the first creation originated in Lima in the early 1920s. There are many stories who created. 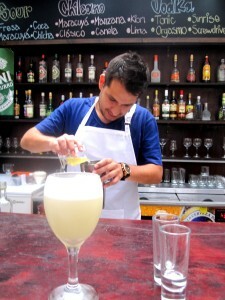 Apart from the Pisco other main ingredients are lime juice, egg white and sugar syrup. Usually the cocktail is served in three sizes: Single, Double or “Catedral” (Cathedral). When prepared right the drink is a fine balance between the quite strong Pisco (alcohol percentage of between 38% and 48%), the intense lime juice and the sweetness of the sugar syrup. 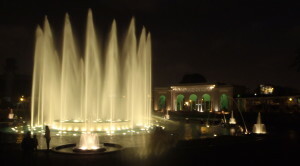 Get acquainted with the Peruvian capital, and learn about when it was founded in 1535 and became the “City Of The Kings” We going to pick you up from your hotel and take you to a fascinating walking tour in our historical center. together with our expert local guide we will take you, to our tour route! it’s different as the classic and unique, we will show you the Palaces and castles our city hide, we also going to take you to our great Saint Francisco Monastery and the impressive underground Catacombs!. Our historical center is considered a World Heritage protected by the Unesco, We are proud to be the only one tour company who can take you to visit The Original Spain Mansion Palace and enjoy its great collection of 18th Century Original Oil paintings, its impressive sculptures, wooden varandas, trendy gilded mirrors and great original terrace. We recommend to wear comfortable clothes and shoes, sunglasses, sunscreen and a hat, take a bottle of water with you and spare battery for your camera. 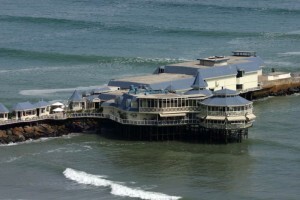 We will also visit the exclusive restaurant “La Rosa Nautica”, where you will learn to prepare the famous “Pisco Sour”, by an expert barman, and the delicious “Ceviche” prepared by the cheff of the restaurant. 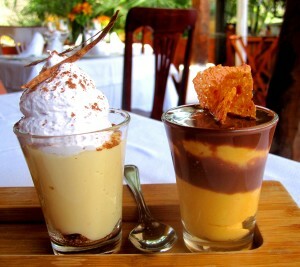 Then you will taste a delicius lunch featuring the most representative dishes of the peruvian cuisine.